I still feel like it was last week I decided to give up my “safe” job at Web Associates Level Studios to play around with the ENTP crew. Well, it’s time for another move. Last week I was given an offer I just couldn’t refuse–to join the amazing GitHub team (my GitHub profile). 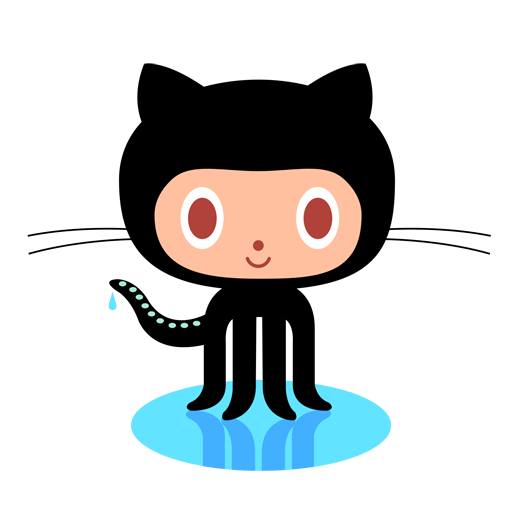 For those of you who don’t know who GitHub is: shame on you. GitHub has taken something as boring as source control and made it something that brings people together. Social coding, indeed. The past couple of years have been a crazy blur of projects for me. Most of what I did for ENTP was for [redacted], so you won’t be seeing most of what I did, but I thought I’d spend a few minutes to archive (for my own good) some of the public-facing projects I completed. By in large, the biggest project I worked on ENTP was Tender – and I’ll be honest, it’s going to hurt to let this go. 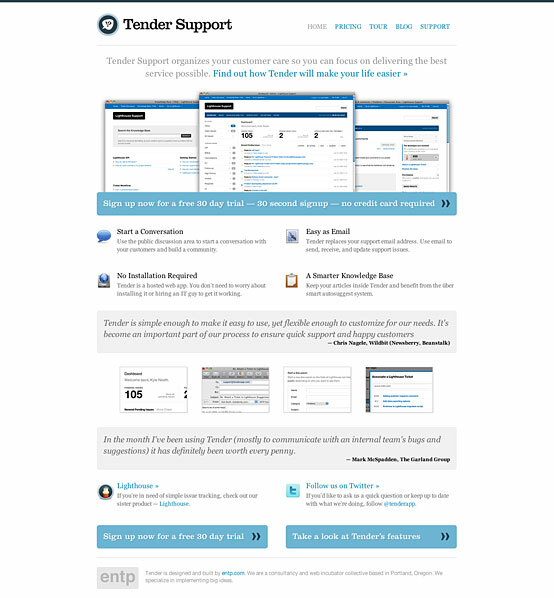 Tender was my baby, and I did all of the IA, design and front-end work for the site as well as some marketing and analytical work. The shining side of that tunnel is that of course GitHub uses Tender for their support, so I’ll at least get to use it and see how ENTP shapes the product. 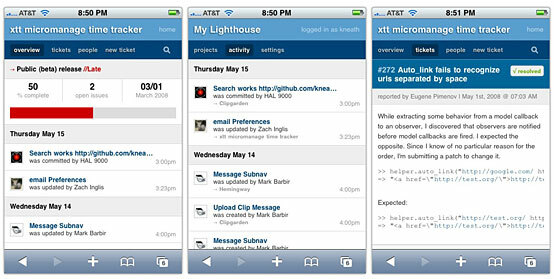 Designing an iPhone optimized interface was one of my first projects at ENTP. It doesn’t benefit from any of the OS 2.0+ features (HTML5, CSS Animations, Etc) since the code was created before these came along, but it gets the job done. It was a great exploration in turning a complicated interface and trimming it down to the bare essentials. 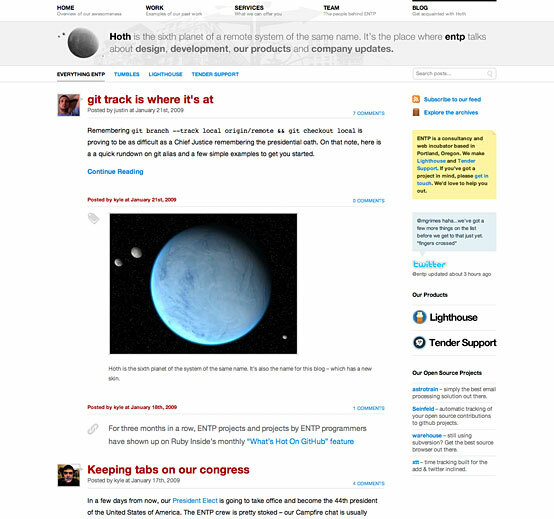 I designed this in collaboration with Justin Palmer when ENTP decided they needed a new site. It’s got a few interesting features (like pulling in our current GitHub projects on demand in the footer), but it’s mostly just a brochure site for the agency. Hoth is ENTP’s blog. 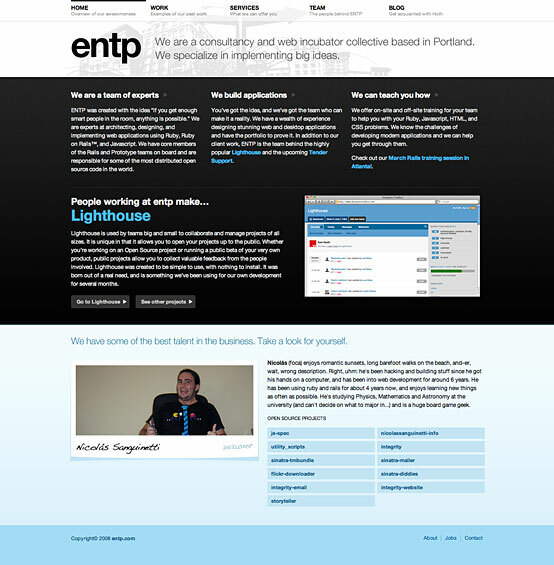 This design accompanied the new ENTP.com design and added in a bit of tumble-like functionality to the templates. So now I enter the third dream job I’ve had in the 4 years since I graduated college (none of which have been slightly related to my degree). I’ll be diving into a design/front-end role for the team and help clean up and take the product to the next level. I’ll see ya’ll at the next GitHub drinkup.